My favorite Krispy Kreme, the only one in our city when I was a child, has closed. This both saddens me and relieves me. It relieves me because our car seems to have a tractor beam to that doughnut shop whenever the red "Hot Doughnuts Now" sign is lit. No matter how strong our reserve, it is not strong enough to resist the temptation of gooey balls of dough cooked in hot grease and covered in a shower of sugar. It saddens me because I can remember as a child, and as an adult standing with my own children, watching the progression from ball of gooey dough to finished doughnut. This transformation held a fascination for young and older eyes alike. It is not a quick process for the would-be doughnut. First the formed circle of dough is extruded onto a shelf which travels up and down and up and down in a proof box. Inside the proof box, heat and humidity are set at precise levels to provide for perfect rising of the doughnuts. Once the twenty minutes of rising has finished, the doughnuts are plunged into hot oil to cook. The doughnuts bobble and float on one side in their 350° bath of oil. Then they are flipped onto their other side. After coming out of the oil bath, the doughnuts ride underneath the sugar glaze waterfall becoming completely coated with sugar. 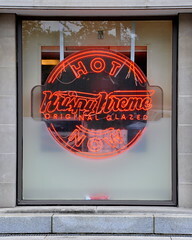 If the "Hot Doughnuts Now" sign is on, this is the point in the ride where the Krispy Kreme employee uses a wooden stick to remove your hot doughnuts from the line into your box, the glaze still wet and dripping. It is a long ride for the doughnuts, but it is worth every second. There is nothing like putting a hot Krispy Kreme glazed doughnut into your mouth. In fact, my husband and I have often joked about having a contest to see who could cram the most hot doughnuts into their mouth at once. We are a lot like those Krispy Kreme doughnuts. Once we have trusted in the Lord Jesus, we are shaped in the perfect shape, but we have a long ride to go toward perfection. The Lord lets us ride up and down and up and down the shelf of the proofing box, where it is hot and humid, to affect the perfect "rise" in us. Just when we might have thought it was time for a good pat on the back and a time of rest, we are plunged into a hot oil bath to cook for awhile. When we think we just can't stand the trial of being cooked any longer, we are flipped over and cooked on the other side. It's only after we pass to the other side of the oil bath, that we can see ourselves fully enrobed in His righteousness and His perfect work of conforming us to the image of His Son has been completed. You can watch how the doughnuts are made here. I have a 10x mirror I use when I put on my makeup. It is a useful tool and it is a terrible tool. It is useful because it helps me to see what I would not normally be able to see and helps me to easily put in my contacts and apply my eyeliner. It is a terrible tool because each little wrinkle appears to be about six inches long and two inches wide! Each of us as our days go by notice the subtle signs that we are aging. We can't hear as well as we could before. We can't see as well as we could before. We can't remember as well as we could before. We can't move as well as we did before. We look in the mirror and see lines and crevices where once was smooth skin. There is nothing we can do to stop the hands of time in our lives, time will continue on at it's appointed rate. But there is something we can do to stop how we feel about the changes which are happening to us. So as age creeps on let it be for us the promise of eternity ahead. Let us see each new gray hair and wrinkle as the assurance from our Loving Father that we will spend a long and joyous eternity in His presence and let us remember that there are great and glorious days ahead. your heart shall live for ever. " A sweet friend of mine received terrible news this week and is now struggling through the darkest time in her life. I was with her when she heard the news and her first reaction, like many of ours facing the same pain and grief, was that of questioning. “I just don’t understand,” she cried over and over. This is a simple but profound truth in the universe: God is God and we are not. The sooner we believe this the easier our acceptance of all those difficult, dark, painful places in our lives will be. Yet, each of us can look back on our lives and see times when we acted as if we “were God”. We acted as if we had perfect truth, perfect knowledge and perfect wisdom. The truth is we don’t and we should humbly throw ourselves at the feet of the only One who is and will ever be, God. There is a corollary truth: God’s way is perfect and ours is not. If given the ability to completely choose everything for ourselves, we would make mistakes. We would choose poorly. Doesn’t our past prove that to be true? Right now, each of us can most likely look back on our lives and see times when we made the stupidest of decisions, but at the time we thought them to be wise and true. Our way simply isn’t perfect and isn’t going to be perfect. It behooves us to trust totally in the One whose way is always perfect. I know that I have disappointed myself far too many times, but the Lord has never disappointed me. Looking back on the dark times in my life when I didn’t understand, such as my friend is traveling now, I could later see the wisdom and perfection of the Lord in my life. He took me through dark places I would have never chosen for myself to reveal Himself to me and sometimes to reveal Himself through me to others. Frances would have never led herself there of her own volition. So as we walk the path the Lord has made plain before our face, be it the dark of night or the bright of day, let us remember – no, let us cling to these two truths. God is God and we are not, and God’s way is perfect and ours is not. These will be shining lamps to us in times of darkness and ports to us in time of storm. Many people have begun writing a book, sometimes creating what they believe to be the "great American novel." Few however, have actually finished one. Totally, completely finished. We have a friend who is a writer. He has been a newspaper columnist for years, has written several short stories (one of which we make a point to read every Christmas) and he has written a novel. It is a good novel, a very good novel -- I've read it. Yet, he keeps tweaking and rewriting it. You see, even though it was very good, it is not yet good enough for his standards. Although it has been finished, it is not completely finished. . .yet. I know how he feels. In the summer of 1991 I had two babies. One was a beautiful little girl weighing 8 pounds, 5 ounces with black hair and dark blue eyes. The other was made of paper and pictures. While I carried the baby girl for 40 weeks, I worked on the book for a couple of years. I had started writing a manual for new obstetric nurses in my Labor & Delivery unit. A friend of mine and former colleague, Betty, who worked in the Education department of the hospital contacted the University of South Alabama to have them publish it. This was before the days of home computers, so I used a simple word processor and drew many of the pictures myself. I slaved over the "galleys" -- the blue copies that are sent for proofreading and corrections. Each time I thought I had the copy perfect, the next set of galleys would show errors, either on my part or the part of those creating the galleys. Finally, after I was at home on maternity leave, Betty brought a present for our new little girl and she brought me a present as well. . .a couple copies of the finished product -- our book. (Betty had been such a help to me, providing research, communicating with the publishing department of the University and doing the footwork for the final publication, I added her name to the byline as a courtesy and a testimony of our long friendship). The project was finally finished. Totally and completely finished. Like our writer friend, I was never totally content with the quality of the work, but it was done, a book I could now hold in my hand. The Lord is working to conform us to the image of His Son, moment by moment, day by day, and "we all, with open face beholding as in a glass the glory of the Lord, are changed into the same image from glory to glory, even as by the Spirit of the Lord," (2Corinthians 3:18). That which the Lord has begun, we can be sure He will finish, His manuscript will be complete, there will be no errors in His finished work, no complaints from us or Him at the final reading.